HomeMy DNA Says I Am From Where?! 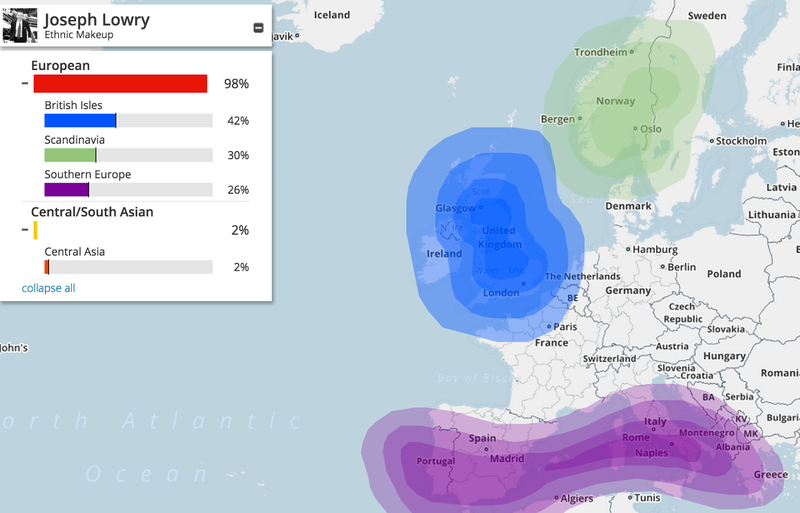 My DNA Says I Am From Where?! Trying to figure you where you came from historically and genetically is much simpler than it was a decade ago. Several companies offer DNA tests that include ethnicity estimates. These estimates are created by analyzing your genetic material (just a small amount of saliva) and comparing it to thousands of others. While realizing they are only estimates, they provide a little more truth to statements such as, “I’m 50% Irish, 30% German and 20% English,” or whatever you’ve always believed your ethnic breakdown to be. Keeping in mind that these are estimates and that Europe is as much of a melting pot as America can lead to some interesting statistics. We create estimates for your genetic ethnicity by comparing your DNA to the DNA of other people who are native to a region. The AncestryDNA reference panel (version 2.0) contains 3,000 DNA samples from people in 26 global regions. We build the reference panel from a larger reference collection of 4,245 DNA samples collected from people whose genealogy suggests they are native to one region. The images below show the process of gathering local samples from various parts of the world. Each panel member’s genealogy is documented so we can be confident that their family is representative of people with a long history (hundreds of years) in that region. Each volunteer’s DNA sample from a given region is then tested and compared to all others to construct the AncestryDNA reference panel. In the end, 3,000 of 4,245 individuals are chosen for the AncestryDNA reference panel (version 2.0). These individuals make up 26 global regions. We then compare your DNA to the DNA in the reference panel to see which regions your DNA is most like. The ethnicity estimate you see on the web site is the result of this comparison. When we calculate your estimate for each ethnicity region, we run forty separate analyses. Each of the forty analyses gives an independent estimate of your ethnicity, and each one is done with randomly selected portions of your DNA. Your genetic ethnicity estimates and likely ranges for these estimates come from these forty analyses. With all of that in mind, I was excited to see my breakdown and learn if it matched my research. That research would indicate that I’m at last 60% German, 25% Irish, and 15% English. Keep in mind this is only going back 5 generations on average; going back any further is rather complicated because of the number of grandparents and the gaps in research. Much to my surprise, it was nowhere close! My AncestryDNA estimate indicates that I am 62% descended from Great Britain, 20% Ireland and only 5% from Western Europe. WHAT?! Where are my Germans?! I have German surnames including Bahle, Witt, Bixler, Governor, Porubsky, Schulmeister, and Pepperney (Anglicized in a few cases) in my family history and they are getting almost no recognition by my saliva! I was a bit stunned by the results but realize that over centuries people move. These results aren’t meant to capture a single moment in time but ancestral makeups throughout history. Once I had my AncestryDNA results, I actually transferred my raw DNA data to Family Tree DNA. They have a service that takes the raw data from another company and uses their algorithms to produce an ethnicity report. After only a few days (since they only had to analyze the data and not test saliva), I had my results based on their algorithm. We assembled a large number of candidate reference populations which were relatively unadmixed and sampled widely in terms of geography. From these we removed related or outlier individuals with the Plink software, utilizing identity-by-descent (IBD) analysis and visually inspecting multi-dimensional scaling plots (MDS). Further visualization established that the reference population sets were indeed genetically distinct from each other. We also ran Admixture and MDS with specific populations to asses if any individuals were outliers or exhibited notable gene flow from other reference groups, removing these. Admixture was run on an inter and intra-continental scale to establish a plausible number of K values utilizing the cross-validation method [Alexander2011]. After removing markers which were missing in more than 5 percent of loci and those with minor allele frequencies below 1 percent, the total intersection of SNPs across the pooled data set was 290,874. The final number of individuals in was 1,353. To validate our Reference Population set we tested them against a list of well studied benchmark groups whose ancestral background in the literature has been well attested. Additionally we also cross-checked against individuals with attested provenance within the GeneByGene DNA database. So both companies test their results against certain population groups who they believe have remained relatively static over time. Still, once I checked my result, I was again surprised and this time for entirely different reasons. My Family Tree DNA estimate indicates I am 42% British Isles (Great Britain and Ireland), 30% Scandanavian, and 26% from Southern Europe. A mere 2% Central Asian is a statistical anomaly that I discount. So what does this imply? It’s certainly very different from my AncestryDNA results. It too fails to properly represent my presumed Germanic background. Neither result indicates anything close to the percentages I had assumed based on my research. This raises so many more questions than it answered. It is forcing me to dig deeper and cast a wider net than I previously imagined in search of the truth of where I come from. I also realize these are simply estimates based on a small bit of saliva. If the tests were run again, the results could be slightly different. Genetic genealogy is a new field for me, and one that I am eager to continue exploring. I plan to share more of these discoveries in future posts! Ball, Catherine A., Mathew J. Barber, Jake K. Byrnes, Josh Calloway, Kenneth G. Chahine, Ross E. Curtis, Kenneth Freestone, Julie M. Granka, Natalie M. Myres, Keith Noto, Yong Wang, and Scott R. Woodward. “Ethnicity Estimate White Paper.” Ancestry.com (2013): n. pag. 30 Oct. 2013. Web. 17 Feb. 2015. Khan, Razib, and Rui H. “MyOrigins Methodology Whitepaper – FTDNA Learning Center.” FTDNA Learning Center. Family Treee DNA, 8 May 2014. Web. 17 Feb. 2015.